THE ULTIMATE MUSE MENU WIDGET IS HERE! The most-powerful, most adjustable and simply the coolest responsive Muse menu widget is here. Desktop & Mobile Menus Included! With a simple drag and drop create a fully functional, multi-breakpoint, desktop, tablet and mobile menu! Complete styling control, custom hover effects, 8 custom menu states, on scroll menu animations and more are just a few of the features that come with Ultimate Muse Responsive Menu. The Ultimate Muse Responsive Menu was carefully designed for 5 individual layouts, with desktop and mobile menus automatically switching according to breakpoints. Menu always looks awesome, no matter from which device it's viewed. For screens less than 1000px in width screens the desktop menu turns into a beautifully designed mobile menu. We have specifically optimized the menu for each of the layouts. And our default responsive .muse file is included with the widget so you can simply drag and drop the menu without having to worry about how it will look on different breakpoints. Menu changes appearance on scroll with Responsive Parallax! Yes! 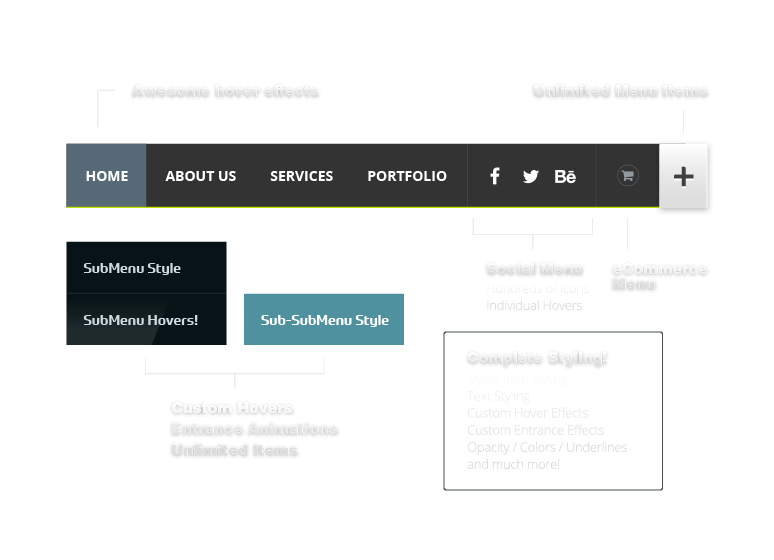 The one effect you missed the most since Muse responsive, the parallax menu switch, is back with our Ultimate menu. Your menu can completely change its appearance when you start to scroll. For instance, your black menu can turn into a white menu when visitors start scrolling and YOU control the styling of both those menus! Along with the normal, hover and the other two standard Muse states, we've introduced two new states, the "Initial State" and the "After State" both with their own four regular states which lets your Muse menu change it's appearance completely when you start scrolling. Best Muse responsive menu widget on the market. Create unmatched menus far beyond Muse capabilities. Just what I need, this is awesome! Great menu indeed. Too many steps, way too complicated…keep it simple, please. Very Nice, but how can i delete Submenu Item whwn i dont need it? Is it possible? Is if possible to remover the submenu and parts I do not need? The Ultimate responsive menu widget for Adobe Muse is finally here! The most-powerful, most adjustable and simply the coolest responsive Muse navigation menu widget is here. Complete styling control, custom hover effects, coolest navigation, 8 custom menu states, on scroll menu animations and more are just a few of the features that come with Ultimate Muse Responsive Menu. On smaller breakpotints, the menu changes into a mobile menu which can be styled in a completely different way. Along with the normal, hover and the other two standard Muse states, we’ve introduced two new states, the “Initial State” and the “After State” both with their own four regular states which lets your Muse menu change it’s appearance completely when you start scrolling.